The national government budget pattern causes a fairly reliable stock market movement each year from July to January each year. In April each year, money is drained out of the private domestic sector by taxes, and the stock market sinks around this time. After April and into the rest of the calendar year, the stock market tends to rise and peak in January after the adoption of the national budget in December. The current account is so small that it plays little or no role influencing the macro fiscal flows and stock market. At present macro global fiscal flows are set to peak in the summer and this is likely to lift the Brazilian stock market with it after its June/July tax take slump. 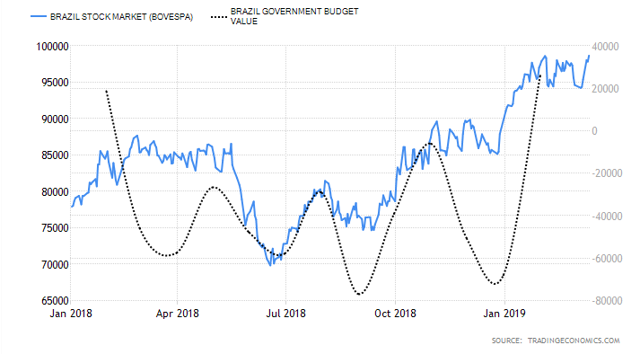 The purpose of this article is to assess the macro-fiscal flows for Brazil and determine what effect these flows will have on the stock market and the economy. The chart below shows the national budget information to January 2019. The two charts below show credit creation and loan growth for commercial banks over the last year. Over the last year loan growth has gone backward with a net reduction on credit money in the economy. People are repaying their loans, or they are being written off as bad debts. Whatever the reason this is money deletion. Loans create deposits and generate reserves at the central bank and the repayment or writing off or loans reverses that process. Brazil's current account is in deficit, meaning that it is swapping Real credits (or more likely foreign currency such as the USD that it has to borrow or earn), which it can make at no cost electronically on a keyboard, for real goods and services from foreign trade partners who are happy to save in Reals. What becomes relevant for a developing nation is to what level it has been loaded up with foreign debt, and this is shown in the chart below. Trade and financial dependency were deemed to be part of an economically efficient global specialization of labor and credit. But Mexico’s insolvency in 1982 interrupted lending and investment until 1990, by which time Argentina and Brazil were obliged to pay 45 percent interest on dollar-denominated debts. This exorbitant rate reflected their failure to develop along lines leading to economic and financial self sufficiency. Investors nonetheless started to lend again, having discovered a new source of foreign exchange. Debtor-country governments might pay their creditors by selling off public enterprises. These privatization programs were voluntary pre-bankruptcy forfeitures, as if governments were not sovereign debtors able to retain the public domain under their own control by obliging bankers and bondholders to absorb the losses resulting from their bad loans. Taking the above information for international and national macro-fiscal flows, one can calculate the sectoral balances, and these are shown in the table below. *Estimate to be updated when the end-of-year numbers are known. #Forecast based on existing flow rates and plans. The table shows that the private domestic sector is in positive territory, which allows it to accumulate net financial assets. The drain from the external sector is offset by the positive flow of funds from the government sector. Looking forward, the election of President Jair Bolsonaro does not bode well for the private domestic sector balance. President Bolsonaro has promised a return to fiscal austerity, surplus budgets and public sector cutbacks. He and his party have committed themselves to Chicago School economic policies, free markets, small government and the privatization of as much of the public sector as possible. Chicago School: Named after the University of Chicago’s Business School where Milton Friedman and other monetarists established a beachhead. The University was founded by John D. Rockefeller, prompting Upton Sinclair to call it the University of Standard Oil (The Goose Step, 1923). The essence of their ideology is that government has no positive role, but is only a deadweight burden. Euphemizing their doctrine as “free market,” they advocate deregulation, claiming that “rational markets” will steer the economy. They also support a tax shift off property onto labor, while denying that their policies create a free lunch for rentiers. The result is to centralize planning in the financial centers – short-term planning that finds debt pyramiding and asset stripping the most lucrative activities. Under such policies the private domestic sector and the assets in it can only shrink, it is a mathematical certainty as the sectoral balances show. 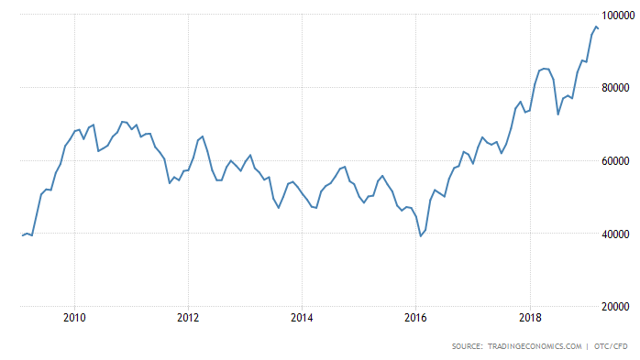 Below is a chart of the stock market over the last 10 years set above a chart of the national government budget and the current account balance over the same period. The 10-year chart above shows that as a general rule the government budget expenditure pattern is a big spend in January, following the adoption of the budget in the preceding December, and then a drain mid-year beginning on April 30 when tax returns and tax payment are due. The chart below shows the interplay of the stock market with the injection and removal of money from the private domestic sector by the federal government. The taxation of money out of the economy in April sinks the stock market in July indicating that there is a two-month fiscal drag effect. Each reduction in the budget expenditure (movement toward or above zero) is matched with a stock market slump a month or so later. Given the January cash injection splurge is over, and we are heading into the April tax fiscal drag phase one can expect the stock market to now ease and drop into the middle of the year and to again rise into the end of the year. One could buy in July and sell in January as a general rule, all other things equal. 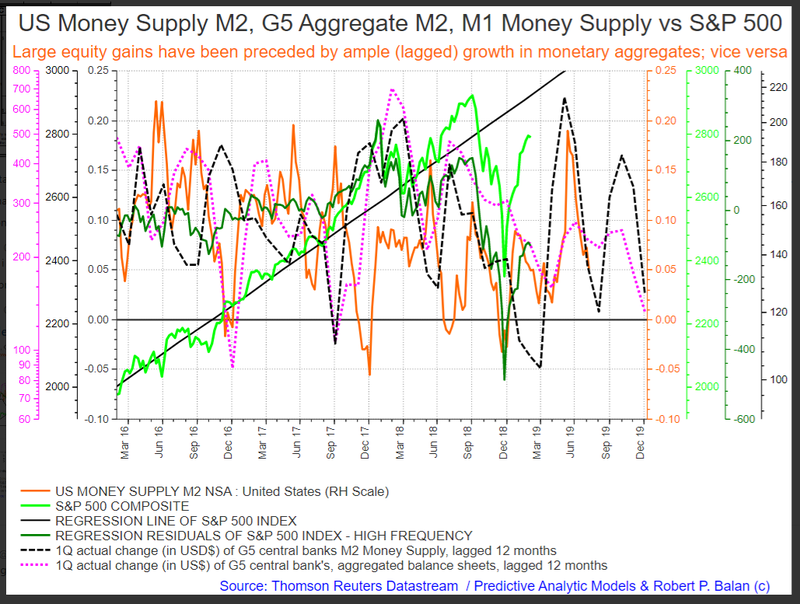 The chart below shows the interplay of the current account and the stock market. The seasonal pattern of the current account on the flow of funds is a dip at the end of the calendar year and a dip in the middle of the year. The impact of the combined flows from government and trade is that the dip in the middle of the year in reinforced from an accentuate liquidity dry spell due to taxation and low trade income. The current account dip in December/January offsets somewhat the positive flow of funds from the government in January. The remaining influence are international fiscal flows. The chart below was kindly produced for me by Mr. Robert P. Balan as part of his PAM service and shows global financial flows for the five largest developed economies in the world. I recommend the PAM service for its advanced fiscal flow analytical capabilities. The chart shows that global G5 bank balances are bottoming at present and will rise sharply into June 2019. This means that the Brazilian tax take in April 2019 takes place at the same time as a global liquidity down-phase meaning that the stock market could well go lower than might otherwise be expected. 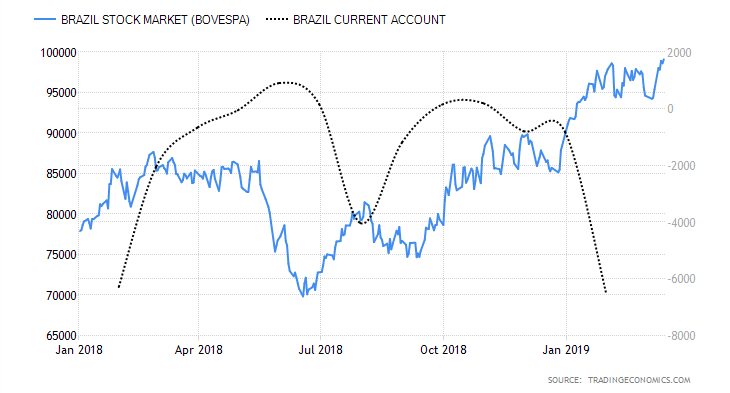 The good news is that the dip can be bought in June/July given that at that time global fiscal flows are rising and will accentuate the recovery of the Brazilian stock market into the end of the year. Regular readers will remember that through 2017 we traded Brazil several times using the 3 x ETF above and made some very good returns.